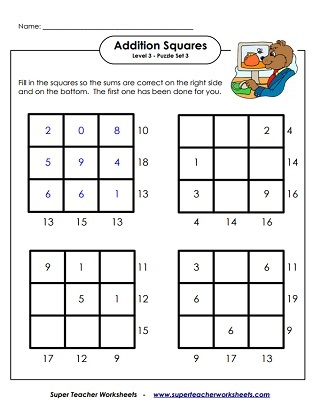 Printable addition square logic puzzles. To solve, students make place numbers in the squares to make the given sums. Students complete the addition squares by putting numbers in boxes to make the given sums. Easiest level. 2x2 grid. Even more level level 1 addition puzzles to build students' logic skills. 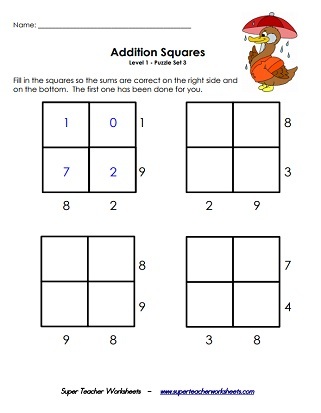 More difficult addition squares. Solve by placing numbers in boxes to find the given sums. 2x2 grid. 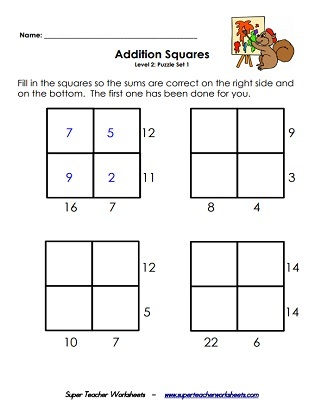 More addition square brain teasers for students to solve; Sums up to 30; Medium level. Most difficult math addition squares on a 3x3 grid. Challenging level. Yet another set of addition puzzles on a 3 by 3 grid for students to solve.